The Grafton Managed HR Services programme focuses on removing the headache of administration associated with volume recruitment. As part of the service, our Grafton consultants become an integral part of your HR function – with the total focus on recruitment, thus alleviating pressure from your HR department and allowing them to focus on core business activities. Our Managed Services are bespoke and specifically developed to provide recruitment support to HR teams that have little bandwidth to broaden their responsibilities. RPO is a form of business process outsourcing where an employer outsources or transfers all or part of its recruitment activities to Grafton and we effectively act as that company's internal recruitment function for some or all of its jobs. Each RPO solution that we provide will be uniquely designed to fulfil your organisation's Recruitment needs. An RPO solution includes solution design, process optimisation, cost management reporting and performance management. Managed Service Programs are designed for organisations that have a large recruitment need (both perms and temps) that requires them to partner with multiple suppliers. 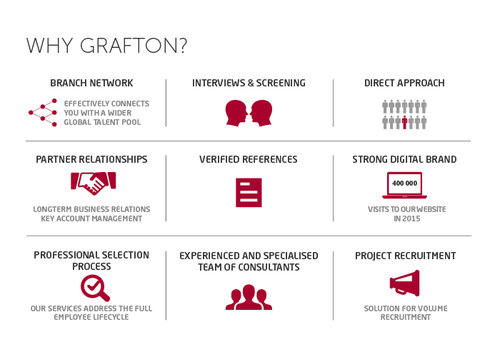 Through an MSP solution, Grafton becomes your recruitment co-ordinator, effectively managing all of your recruitment effort and co-ordinating your suppliers to ensure that they deliver to the highest standard. An MSP solution includes solution design, process optimisation, vendor management, cost management, reporting and performance management. Do you need a senior HR executive to manage organisational changes or participate in projects on an interim basis? Grafton will provide you with Interim HR project managers to assist you in both planned and unplanned organisational developments. A managed service provides companies with access to the highest levels of HR expertise on-demand, without the expense of hiring dedicated staff. Other benefits of this service include: reduced costs, lower risk of legal action, increased operational efficiency, flexibility in the number of skilled recruiters deployed and their fast adaptation.